BLAEU, W. - Americae Nova Tabula. Americae Nova Tabula. 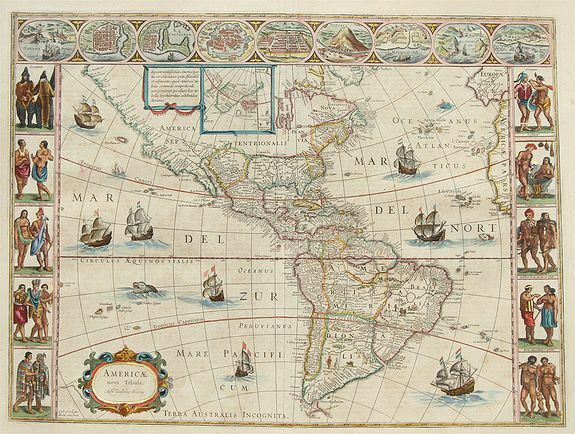 - BLAEU, W.
Title : Americae Nova Tabula.. Date : Amsterdam, ca. 1645. Size : 16.1 x 21.9 inches. / 41.0 x 55.5 cm. Colouring : Original colors with possible later additions. Description :Blaeu's America, with extensive gold highlights. Blaeu's famous map of America is flanked by panels on three sides. People of Virginia, Florida, California, and South America are illustrated on the left and right, and nine New World cities are depicted along the top. Dutch text on verso. Chile Inhabitants - male headdress and gold streaks on clothes. Condition : Good to very Good. Wide Margins. No repairs or damage to map. Some age toning. Small smudge mark upper left corner near Tropic of Cancer, showing possible additional coloring to map.